Shows the currently selected redline feature in the redline feature listing. 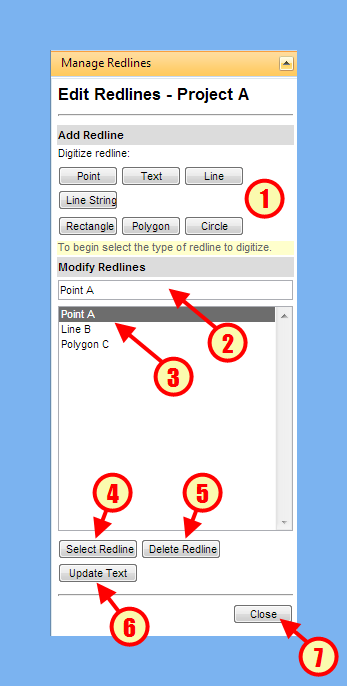 Shows the redline features in the current redline project, each named after the label string of the created redline feature. Click on a redline feature's name in order to select it. Select a redline feature's name in the redline feature listing and click on the "Select Redline" button in order to select it on the map. Select a redline feature's name in the redline feature listing and click on the "Delete Redline" button in order to delete it from the redline project. Select a redline feature's name in the redline feature listing and click on the "Update Text" button in order to update the redline's text label. Click on the "Close" button to stop editing the redline and return to the "Manage Redlines" section.